SFHA has been working with Smart Energy GB to promote the rollout of smart meters across Scotland. We’re now entering the next phase of this partnership to ensure we’re helping everyone to understand the benefits smart meters can bring. This year, we want to support our members to reach out to tenants on low incomes to let them know the potential benefits of having their own smart meter. SFHA is encouraging all members to engage in face-to-face conversations with their low income tenants about the rollout to support them to understand the benefits of smart meters, including making budgeting and saving simpler. Increasing tenants’ interest in getting a smart meter. To help members reach their tenants, Smart Energy GB has created a specialist leaflet for housing associations to use to communicate with their low income tenants, pictured below. SFHA is encouraging members to use the leaflet in face-to-face engagement with tenants and to distribute directly to households. You can order printed copies of the leaflet to use in conversations with your tenants. 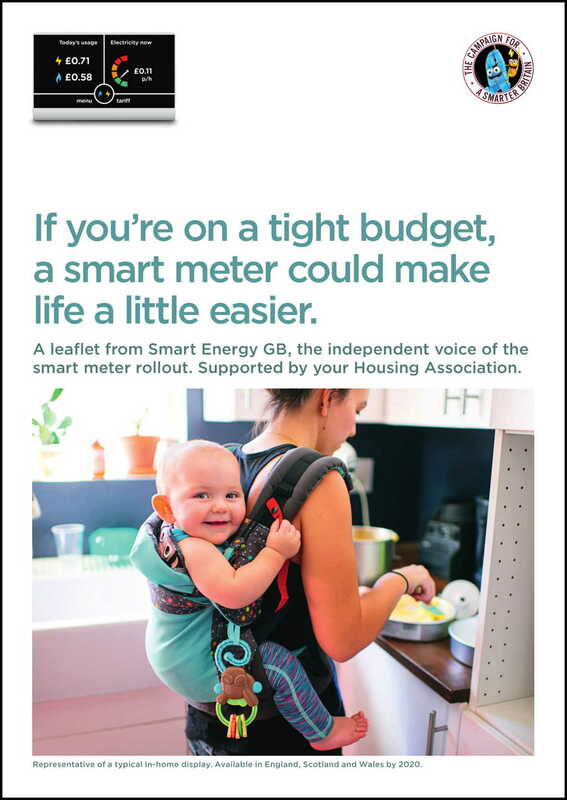 To order printed copies of the leaflet, please visit the Smart Energy GB Resource centre or, if you’d like it co-branded with your organisation’s logo, contact Conor Hill, SFHA Policy and Public Affairs Officer, at chill@sfha.co.uk. You can also find other support materials, social media images, and videos on the Resource centre. For further information on smart meters, you can also download our Frequently Asked Questions document which covers General Information, Installation, Billing & Switching, and Maintenance. There are lots of ways you can communicate with your tenants about the smart meter rollout! SFHA would love to hear from our members about the work they are doing to support their tenants with the smart meter rollout. To share your stories, please contact SFHA Policy and Public Affairs Officer Conor Hill at chill@sfha.co.uk. You also play an important role in helping us understand what tenants think about smart meters and our campaign, which helps inform what Smart Energy GB does in the future. SFHA is encouraging members to distribute consumer surveys to the tenants they speak to about smart meters. If you have conversations, run activity, or distribute information about smart meters, please also distribute a survey. Copies of the survey are available for download online and can be returned by you, or the tenants themselves, via a Freepost address found at the bottom of the survey. Smart meters are the new generation of gas and electricity meters, replacing traditional meters in homes across the country. They send automatic readings directly and securely to the energy supplier, and have a display that shows exactly how much energy is being used and how much it costs, in near to real time. By 2020 every household in Britain will be offered a smart meter, and by the end of 2020 it’s estimated that 26 million will be fitted. To help you understand more about smart meters and the rollout there are a range of useful educational films on Smart Energy GB’s YouTube channel.